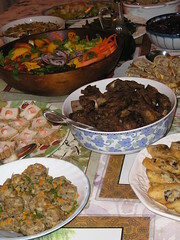 There were fourteen dishes, plus assorted desserts at a recent buffet dinner at my friends the Changs. It felt as if we were celebrating Chinese New Year in August! We started with steamed buns with braised duck and apple slices, out on the patio. Then at the buffet set up inside, we enjoyed mini tofu spring rolls, red cabbage salad, golden seafood rolls, layered tofu squares, tilapia and mustard greens, stir-fried bamboo shoots and pressed tofu, braised green beans with potatoes, triangular stuffed tofu pockets, braised cellophane noodles, chicken meatballs, sugar glazed spareribs, and Pat Ward’s gorgeous composed salad (see the photo below; Pat is a a food professional, can you tell?). Other guests contributed to dessert, which included fruit (the cantelope was especially luscious), and baked goods, including a lovely blueberry crisp (or crumble? 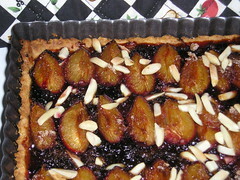 ), and if I do say so, my own plum tart (photo below), the Joan Nathan recipe I love so much. When I make it now, I substitute cardamom for at least half the cinnamon, though, as I find cardamom more interesting lately. 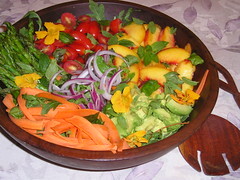 I am probably forgetting someone else’s great dessert, by then we were all in a food daze, so apologies to any and all. More than great food, the evening was a gathering of really nice neighbors and friends of the Changs, a most convivial group, and an evening we will all remember fondly, thanks to our wonderful hosts.